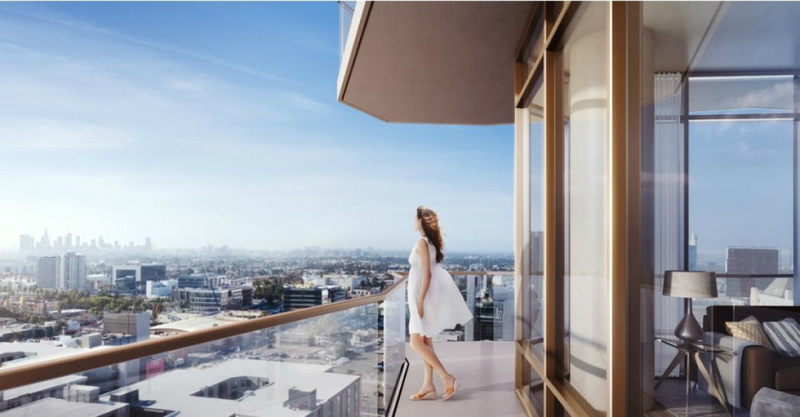 Los Angeles—based firm LARGE Architecture and developer Related California have released a new batch of renderings for 1755 Argyle, a midcentury modern-influenced, 18-story mixed-use residential tower project in Hollywood, California. 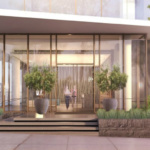 The project would bring 114 market-rate apartments, 2,100 square feet of commercial space, and a five-level, 201-stall parking garage to the fast-growing neighborhood. 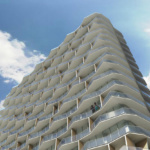 The tower is expected to contain a mix of studio, one-, and two-bedroom units. 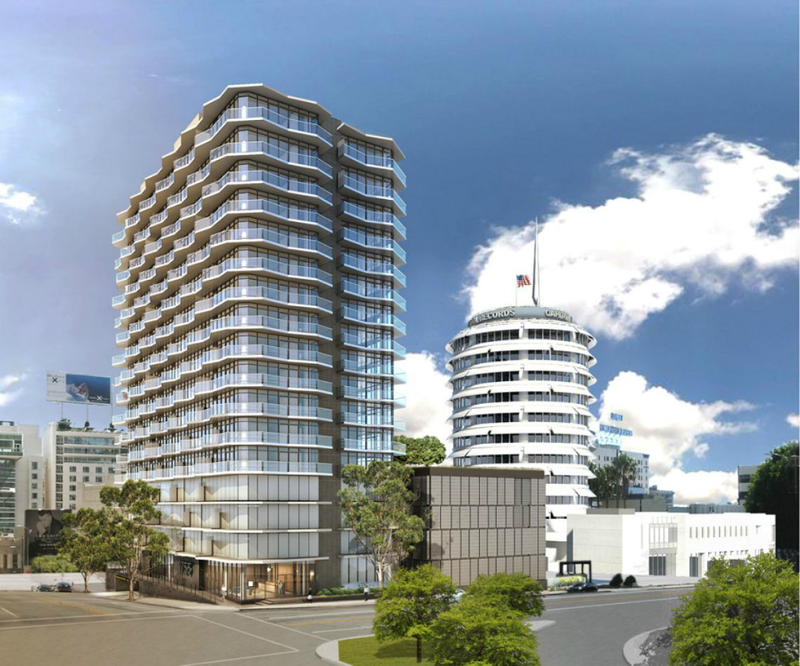 Plans for the tower also call for an integrated fitness center and swimming pool lounge area. 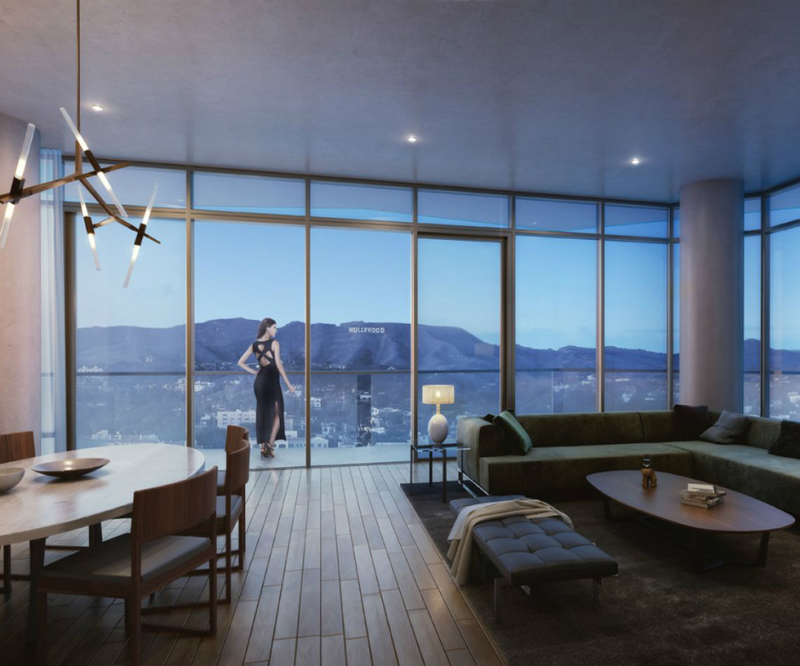 Based on renderings from the firm’s website, 1755 Argyle is articulated as a striated monolith, with zigzagging floor plates projecting from the floor-to-ceiling glass curtain walls that wrap the building on all sides. 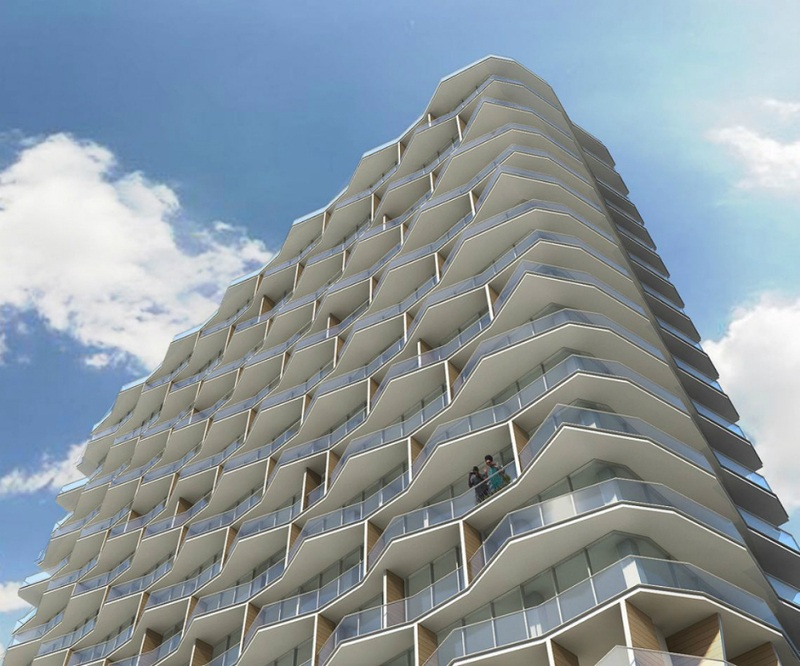 These projecting floor plates give the tower an intricate, geometric appearance and are designed to function as exterior balconies for the housing units contained within. 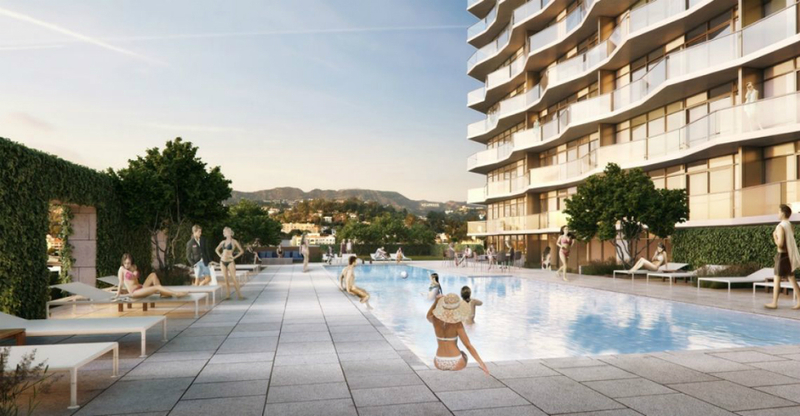 A fifth-floor terrace located above the project’s parking podium contains outdoor amenities for the tower, including a swimming pool and lounge spaces. 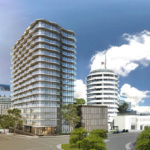 The project is located across the street from the iconic Capitol Records building along a bustling stretch of Hollywood and near a subway stop along the region’s Red Line (close to the intersection of Hollywood and Vine streets). 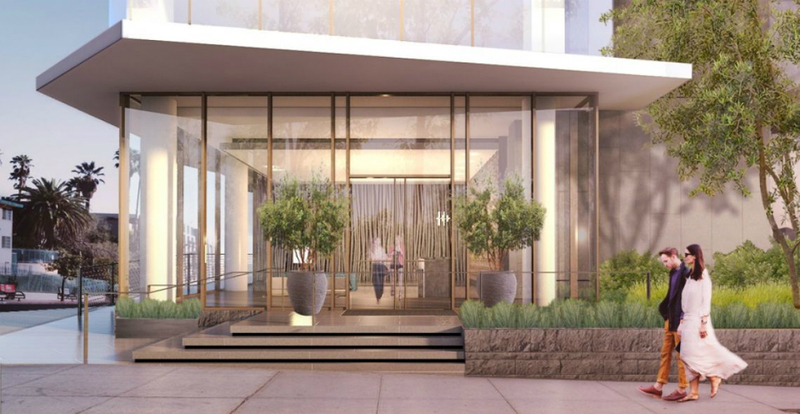 The area has seen a boom in low-rise, wood-framed apartment blocks in recent years, but has had a hard time getting taller—and therefore, more controversial—buildings approved for construction, including the troubled Millennium Hollywood project. 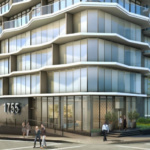 That project, located around the corner from 1755 Argyle, has been plagued with delays itself due to fears that its dual 39- and 35- story towers might be located above an active fault line. 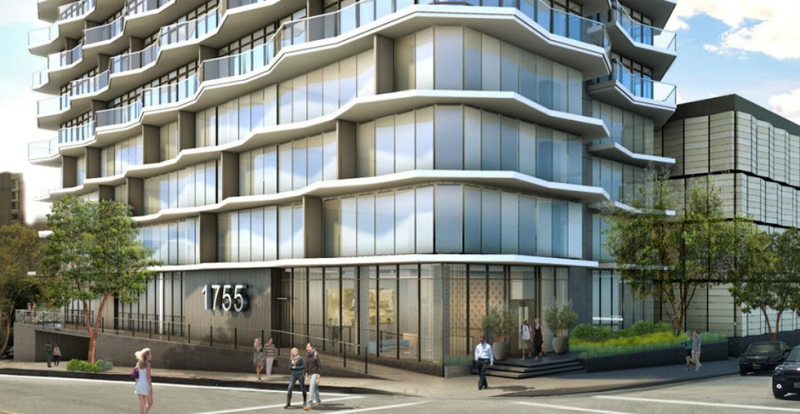 It is still unclear if the Millennium Hollywood project will move forward, but 1755 Argyle is currently under construction and expected to open for occupancy in 2018.